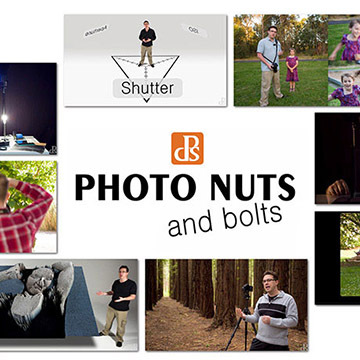 Copy these 3 techniques for basic family portrait poses and turbo charge your group portraits. 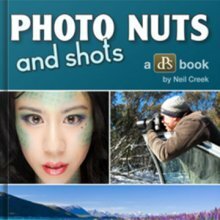 These are good photography techniques to use whether you are doing casual snapshots of friends or you are doing formal family portraits. Photographs are more interesting when your subjects are not exactly the same height in your photo. In this photo, each person's eye level is different. The grandfather is tallest. The grandmother is next tallest, and so forth. Draw an imaginary horizontal line across the photo through each person's eyes. Notice that none of the six people's' eyes are at the same height. I had the grandparents stand, the father knelt on one knee, the mother down low on both knees, and then made sure the two grandsons were placed at slightly different levels. Try a few different arrangements without using any stools or chairs as posing supports. Form triangles when you pose groups of three or more in a group photograph. This is a basic rule of composition in photography and other with other works of art as well. It creates balance in your composition. Large family portrait poses are often made by starting with a basic triangle and building additional triangles outward as you add people to a group portrait. Use supporting structures like stair steps, boulders, tree stumps, or even posing stools when available, to experiment with getting your subjects at just the right height. 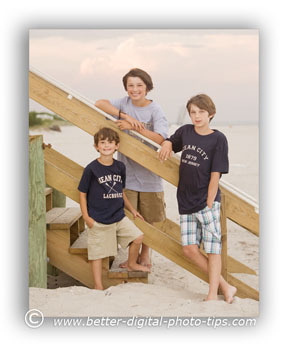 I had the boy in the gray shirt go up one step to create the triangle of these three brothers. The tallest and oldest boy is standing at the lowest point in the sand. I composed at an angle to get the cool-looking clouds behind them in the background. 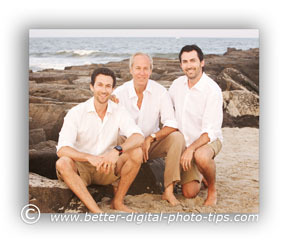 Here's another example of a simple pose for a family portrait of three people. You can use this pose when two of your subjects are taller than the third. I posed the grandfather with his shoulder behind the young girl. This blocks part of his body from the camera and makes him "smaller" in the pose. The other technique to use is to turn your subjects to about a 30-45 degree angle away from the camera. The two subjects on the ends are turned toward the center of the composition. 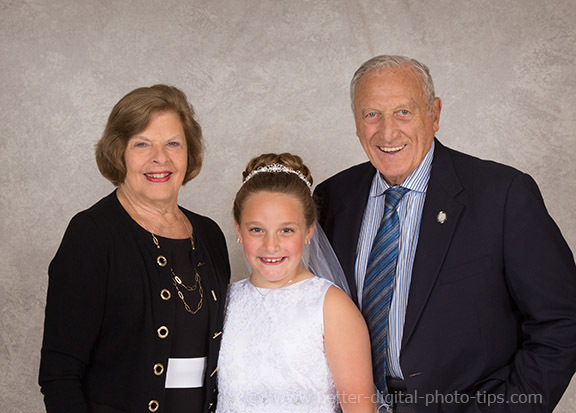 They frame in the main subject, the young lady who is receiving her First Holy Communion. Diagonals add a dynamic to your photography posing. Diagonal compositions give your eye a vertical and a horizontal direction to travel as your eye views an image. Two of the men sat on rocks at different levels. The third knelt on one knee to create this diagonal portrait pose. Always make sure the horizon is perfectly level too with a pose like this one. As you can tell, I do quite a bit of beach photography portraits. You can use these family portrait posing ideas and the other tips on taking digital photography with other kinds of photography as well. Often the rules of composition in one kind of photography apply to other kinds of photography. When you have 5 people to pose in a family photo, the "M" pose is often a great option. If you draw an imaginary line, starting on the left, from each subject's head to the next, and ending on the farthest to the right, you will have drawn the letter M.
Family group shots of 5 people using the "M" pose. Overlap their bodies so that they are visually connected to each other. A good pose, combined with good lighting, and a real good looking family make for a winning portrait! 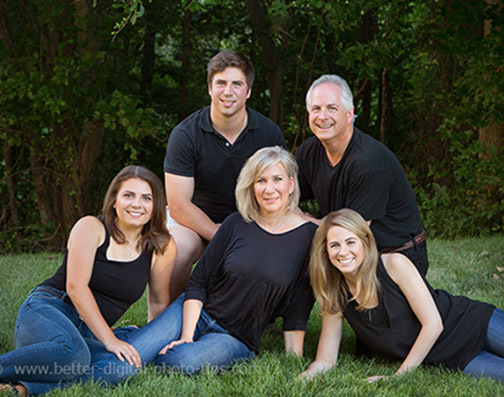 Use the "M" pose for family group shots of 5 people. It's not show in the posing article, but imagine for a second if you switched the pose to a "w" pose. There would be three people posed behind the two people in front. Either one of these family poses can be effective. Shoot your group pose both ways if you have time and then pick the favorite pose after the photo shoot. It's one of the biggest advantages of digital photography, the ability to shoot extra poses and only have to "pay for it" be spending a few extra seconds of your time. 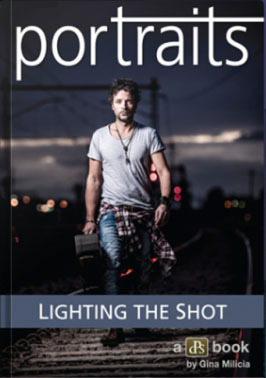 Portrait Photography Books. 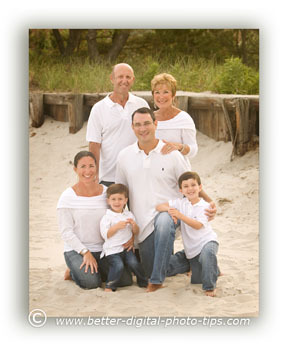 I have learned quite a bit about basic family portrait poses by reading photography books specifically about portraits. 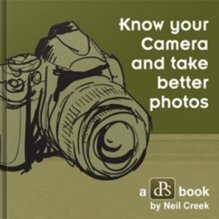 Here I give reviews on three of the books in my photography library that I have found very useful. Better Digital Pictures. 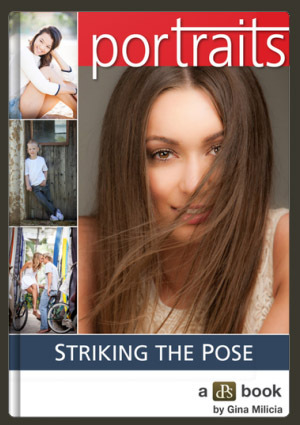 You may also enjoy this article on basic photo composition, photo lighting and photo exposure in order to improve your overall photography, not just your family portrait poses. Photography Composition. These are 10 tactics of composition and sometimes do not apply to traditional family portrait posing but are useful for you to improve your composition technique in general. My final tip is always to enjoy the process of learning better photography. Make it fun. For it's your hobby, not your main occupation.